Will the rise of ChatBots bring about the death of Mobile apps? A great virtual migration is underway from predominantly desktop dominant users to mobiles. Chatbots, the cause of this shift and an emerging vital force, are set to replace the use of websites and personalised applications. On an average, a person uses a standard of 4-5 apps every day, while the day you cleanse your phone of unnecessary apps is coming close. Quite simply, we are unable to take in and digest all the information so readily available to us. We certainly can’t read all the brilliant books and magazines, listen to every single amazing song, watch all the acclaimed movies, and utilise every bit or byte of technology available. Mobile apps have made this process even more difficult by adding a number of points of resistance. For instance, when you look for an app, you need to browse, find and download the right app, then register, remember a user name and password and, lastly and most importantly, remember to revisit the app. This tedious process has seen the rise of just a handful of mobile apps, the ones most commonly used on a daily basis. While thousands of similar applications created sit aside, ignored and unused. 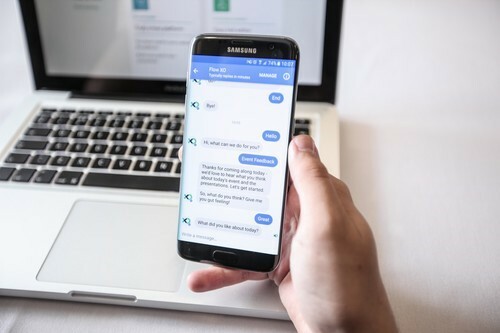 Far from a new phenomenon, Chatbots development in Singapore has been in the spotlight ever since facebook welcomed third party developers onto their messaging platform. The Bot experience is fast, easy and incredibly simple. You don’t need to sign up or remember unnecessary passwords or user Ids with a Bot. More importantly because Bots have access to your social information, they can instantly personalise data to suit your profile. The internet is being flooded with Bots that take care of everything, and can solve issues in a flash. Especially unique is the ability to use Bot service without the need to register, or sign in and out of a domain. Bots are quickly growing as the first used interfaces with one time users. If you’re looking for the best pizza place near you, wondering if your favourite t-shirts are in stock, a bot is always standing by willing and ready to assist. Bots are designed to assist very specific interest and are best suited for business in the following sectors. Local Service – Bots are brilliant at getting you the help you need right to your doorstep. If you’re looking to get a leaky faucet fixed, reserve a table at your favourite restaurant, order a meal; a Chatbot will take care of your needs. Retail – When you’re at a store all you do is ask for the product you want and an executive will bring it to you, right? Well a Bot can do the exact same thing, no more browsing through pages of images and text. Reserve products you’d like with ease. Customer Service – Skip the need to ring a toll free number, Bots can easily replace the frustrating customer service experience of being put on hold repeatedly, to immediate and complete care and resolve. Social friend – Bots make great group chat companions, always on the ready to book tickets to shows, make reservations, or even book a trip. While Apps struggle to be discovered, Bots show a pronounced and popular presence online. Bots are predicted to replace use of websites and even phone calls, leave alone apps. While Bots gain more recognition and larger user bases, a majority of Mobile apps are metaphorically rusting away. Personalisation of content and searches is the new technological wave ChatBots seem to be surfing like pros.